Walgreen Co. (WAG), together with its subsidiaries, operates a network of drugstores in the United States. This dividend champion company has paid a dividend since 1933 and increased it for 39 years in a row. The most recent dividend increase was in August 2014, when the Board of Directors approved a 7.10 increase in the annual dividend to 33.75 cents/share. The largest competitors for Walgreen include CVS (CVS), Wal-Mart (WMT) and Rite-Aid (RAD). Over the past decade this dividend growth stock has delivered an annualized total return of 9.10% to its shareholders. The company has managed to deliver an 8.40% average increase in annual EPS over the past decade. Walgreen is expected to earn $3.32 per share in 2014 and $3.87 per share in 2015. In comparison, the company earned $2.56/share in 2013. In the press release from Walgreen from yesterday, the company mentioned that it expects earnings per share to hit $4.25 - $4.60 by 2016. Between 2004 and 2012 Walgreen has been able to reduce the number of shares from 1.032 billion to 880 million through consistent share buybacks. The acquisition of 45% of Alliance Boots increased number of shares outstanding to 955 million in 2013, and this figure is expected to increase further through 2015 due to the purchase of remaining interest in AB. The company’s Board of Directors also approved a new $3 billion stock buyback through 2016. The company acquired 45% of Alliance Boots for cash and stock in 2012, which is why shares increased. The company also recently decided to acquire the remaining 55% of Alliance Boots it didn't already own. During the first announcement, the stock fell by 6% in one day; while during the second announcement, the stock fell by something like 15% in one day. While Walgreen won't do a tax inversion and lower its tax liabilities on earnings from Alliance Boots, I don't see this as such a negative. Even with an inversion, which would have taken years to accomplish, US operations would still have owed US taxes. The international operations would have only required Swiss taxes, which are lower than US corporate taxes. However, if foreign profits are not repatriated, but used to expand internationally, US tax liabilities could be postponed indefinitely. 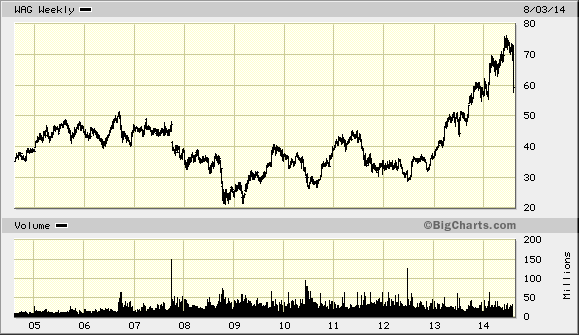 I view the fact that Alliance Boots is being acquired as a major positive for the long-term growth of Walgreen. Acquisitions could be a way to grow earnings, by achieving higher scale, synergies and more negotiation power with suppliers and other business partners. The company has a wide distribution network of over 8500 locations in the US. The size of the pharmaceuticals prescription market is likely to increase over time, which is why the convenience of Walgreen's distribution network for customers should bode well for the company. Approximately two-thirds of revenues are derived from filing prescriptions, while the rest comes from everything else at the store. The big risk is that there are only a few Pharmacy Benefit Providers in the US who can try to squeeze margins for companies like Walgreen. Luckily, Walgreen operates under long-term contracts with those companies. However, there could be some tension when renewing those contracts, as was evident with the Express Scripts (NASDAQ:ESRX) debacle in 2012. However, pharmacy customers are very loyal, which is why if they have the option, they would not like to switch providers. The annual dividend payment has increased by 21.70% per year over the past decade, which is lower than the growth in EPS. This was achieved due to the expansion in the dividend payout ratio. The company is targeting a 30%-35% dividend payout ratio, which is close to what the indicator is right now. As a result, future growth in dividends will likely be much more linked to growth in earnings per share. 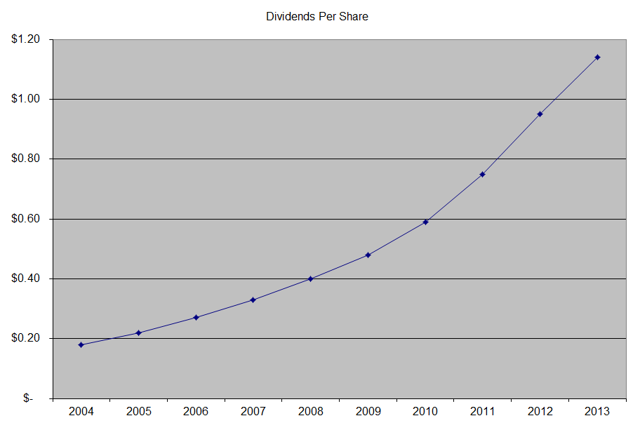 Therefore, I would not expect dividends to grow by around 10%/year over the next decade. A 22% growth in distributions translates into the dividend payment doubling almost every three and a quarter years on average. If we check the dividend history going as far back as 1966, we could see that Walgreen has actually managed to double dividends almost every six years on average. 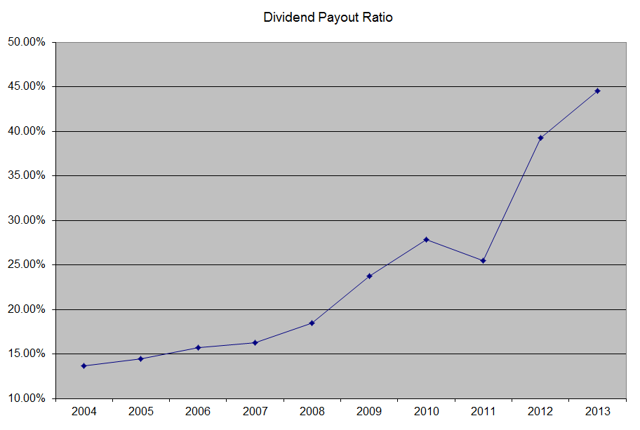 In the past decade, the dividend payout ratio increased slightly from 13.60% in 2004 to 44.50% in 2013. The recent dividend hike to 33.75/share puts the forward dividend payout ratio at 35% expected 2015 earnings per share. Therefore, I believe the payout is sustainable, but will likely be around 30%- 35% in the future. A lower payout is always a plus, since it leaves room for consistent dividend growth minimizing the impact of short-term fluctuations in earnings. 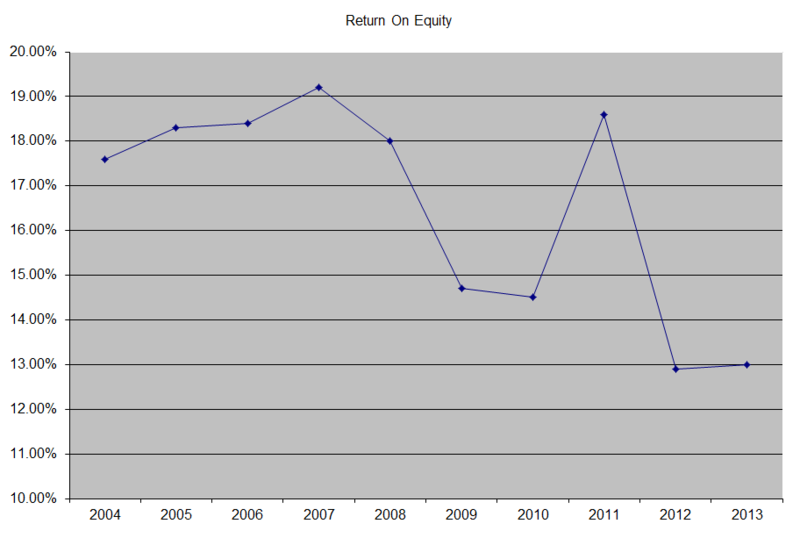 The return on equity decreased from 17.60% in 2004 to 13% in 2013. I generally like seeing a high return on equity, which is also relatively stable over time. However, given the much higher expected earnings in 2014, I would think that this indicator would increase back to the high teens. 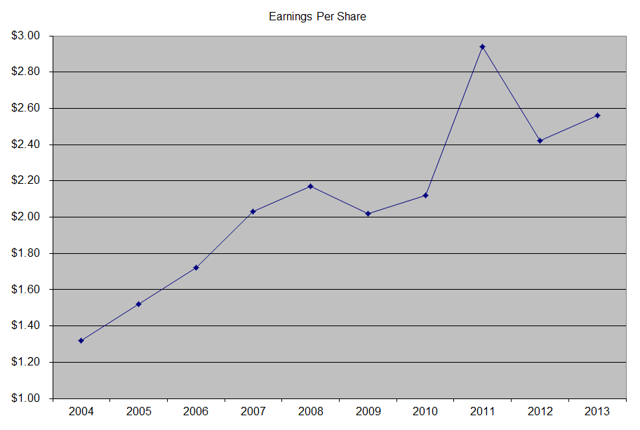 Currently Walgreen is attractively valued at 17.80 times forward earnings and a yield of 2.30%. Either way, I took advantage of the huge sell-off after Alliance Boots acquisition news and added a small number of shares to my existing position. I would be more interested in the stock on dips below $54/share.